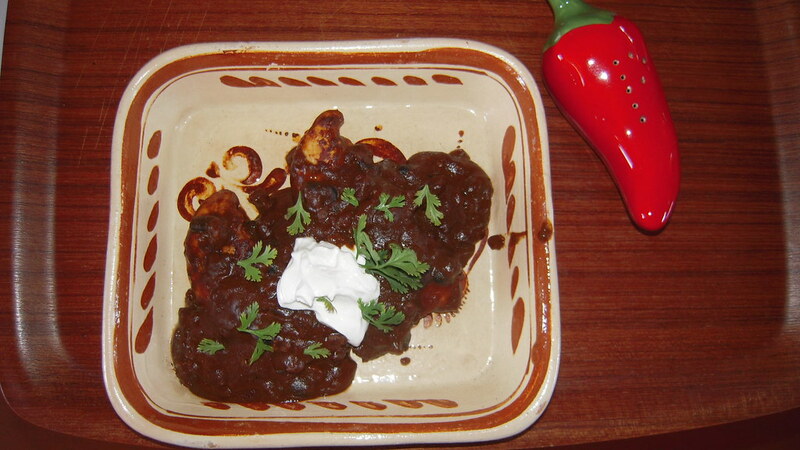 Chicken Mole (moh-lay) may be an acquired taste for some, but I have loved it from the moment I first tasted it eons ago. Making the sauce from scratch can be quite a process, starting off by boiling a chicken (preserving the broth), then getting the meat off the bones. After that, you mix the broth with a combination of peanut butter, chili powder, cumin, garlic, and other ingredients, depending on the recipe you find. 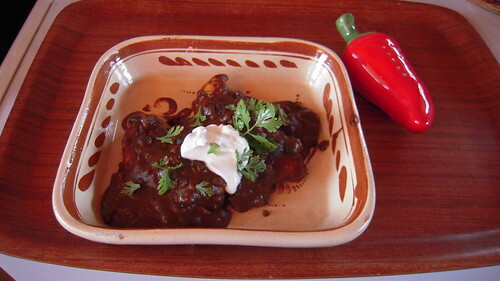 My friend Evie who runs El Pachuco gave me a faster recipe that uses a jar of Mole base (like Doña Maria). She boils her chicken and strains the broth. According to her recipe, she slowly adds the broth to the Mole base in a pan, creating a smooth sauce. She says that at this point, you can add chocolate, chilis, peanut butter, almond paste, wherever your taste takes you. Let this simmer until a thicker gravy develops. Add the chicken and serve with Spanish rice, and tortillas (either corn or flour). This still seemed like too much trouble for me. I wanted something I could allow to cook while I went off to teach for the day. In a blender, I combined 2 cans fat-free chicken broth with a jar of Mole base. I poured the whole lot over about six large chicken tenders in a slow cooker, added 2 cloves of slivered garlic, about 2 tablespoons of wild rice, a heaping tablespoon of unsweetened cocoa powder, and some crunchy peanut butter. I let this combination cook on slow all day. When I got home, the Mole was ready and the consistency was just right. I served it with corn tortillas and black beans. A dollop of sour cream goes well with this. Add a few sprinkles of fresh cilantro out of your garden. These shots of Chicken Mole were made a couple days after the original batch was made. I added the leftover black beans to the sauce, cooked up two more chicken tenders in a pan and added the sauce to it. I froze the rest of the sauce for another time. Easy! Looks great to me – and better yet, it does sound easier!